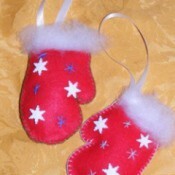 Felt MittensEasy felt and button mittens are a cinch to make while watching TV at night! 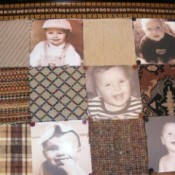 Craft Project: Fabric and Photo Wall DisplayUsing discarded upholstery fabric, a clearance sale frame, felt, and printer fabric, I created this quilt-inspired wall art. 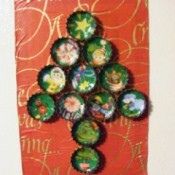 Bottlecap Christmas TreeAn easy craft re-using bottlecaps and promotional magnets. I chose a wrapping paper that had a variety of items to punch out. I punched 12 1 inch circles from the wrapping paper and used Mod Podge to glue circles inside the caps. Decorated Popsicle Stick FrameThis was a craft project that I did with my 3 year old (the first two parts, anyway). The first part was blowing tempera paint bubbles onto paper with a straw. 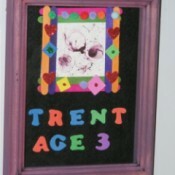 Then we made the Popsicle stick frame and decorated it. Finally, we used tempera paint to stain the unfinished shadow box. 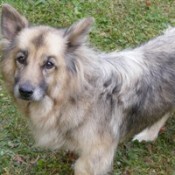 In Memory Of Keesha (Keeshound/Shepherd Mix)Keesha was a 15 year old Keeshound/Shepherd mix. We bought her from a breeder in 1995. She loved to cuddle and be close to her family. She also loved to chase critters out of her yard. Keesha passed away on November 11, 2009. 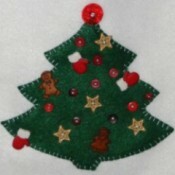 Holiday Felt Wall HangingUsing only felt, buttons, and thread I hand sewed this Christmas wall hanging while watching TV at night!